Rich layered cinnamon sugar crusted dessert bread fresh out the oven, topped with homemade icing. For the dessert aficionado, Monkey Bread from Michael Auhcke is a must try! Michael Auhcke is a small vape juice line, and I do mean small. Currently, there are only two flavors in the line, Pank and Monkey Bread (both 75% VG). They did a great job with the branding on both flavors, and managed to keep everything looking professional. The title leaves no guesswork, and the label summarizes what to expect moving forward. Monkey Bread with Raisins by Michael Auhcke is a sweet, sticky pull-apart vape that oozes with rich, deeply baked cinnamon dough. Turn up the wattage to fully experience the raisins in this innovative, unique, and mind-blowingly delicious bakery treat. Exactly like a batch of freshly baked monkey bread straight from the oven. If you’ve never experienced the ooey gooey, cinnamon bun-esque, baked dessert before, you’re really missing out. Layered brown sugar, hints of caramel icing, notes of raisins, and a wonderful thick bread aroma make this one potent smelling bottle. I decided to rock a set of aliens from Chris’s Coils in the Twisted Messes Squared. I used my DNA 200 box at a 45-70 watts for this review. Front – That signature layered cinnamon sugar-encrusted dough taste right off the bat. I pick up on the raisins, and a nice caramel icing as well. The sugar content is pretty high, but with a dessert vape like this, I’d be upset if it was any lower. Middle – Rich cinnamon dough flavors through the mid section of this liquid as well. The raisins create a really nice chewy texture, and the thick icing works to authenticate that monkey bread taste. End – The raisins really open up towards the end, and work in harmony with the dessert bread flavor. The spice notes are not as strong towards the end either, as the cinnamon seems to fade into the background. Sugar content is tolerable, but definitely crosses the max line for me. Aftertaste – No bad, all things considered. There’s a ton of sweetener working here, combine that with the spices, and you’d expect some lingering for sure. Surprisingly though, this was not the case. Michael Auhcke did a wonderful job with this flavor! This 75% VG mix is slightly better for cloud production than your normal 70/30. I was able to cloud up a large room in about five minutes. Honestly, I prefer this slightly thicker blend over the common 70% mix. It it offers some dense vapor without making a sacrifice in the flavor department. Absolute love Monkey Bread. 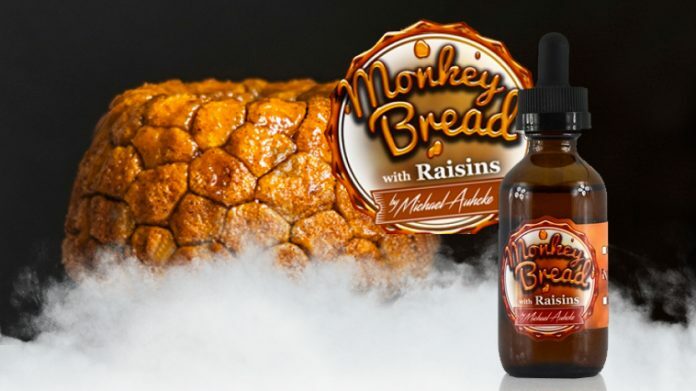 Michael Auhcke does a great job encapsulating that authentic monkey bread flavor. Everything from the spices, to the icing, it’s all there for you to enjoy! It’s on the sweeter side of things, which I tend to stay away from if at all possible; but this one was just to tasty to write off! Would I recommend it to a friend? To someone who liked dessert flavors! Looking for great deals on vape hardware? Visit our Vape Deals page for the best prices around! Previous articleDoes Vaping Lead to Smoking?